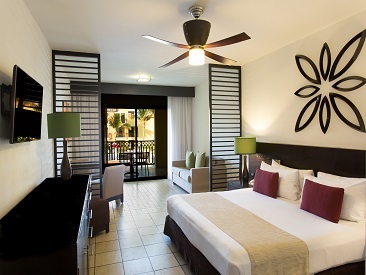 Tucked away amidst the quiet fishing village of Puerto Morelos ("Gateway to the Riviera Maya"), the inviting all-inclusive Ocean Coral & Turquesa Resort provides the perfect setting for an unforgettable tropical getaway. Fronting a beautiful white-sand beach and spectacular coral formations, scuba divers will love exploring the waters surrounding the resort. And with multiple outdoor pools for kids and adults, an upscale spa and daily activities, guests will run out of time before they run out of fun things to do at this polished oasis. The Ocean Coral & Turquesa resort is set up in a series of four U-shaped enclaves so that all rooms have a view of the gardens and pool inside the "U" and many the ocean beyond. The first two enclaves make up "the Coral" section and the second two are "the Turquesa" section. 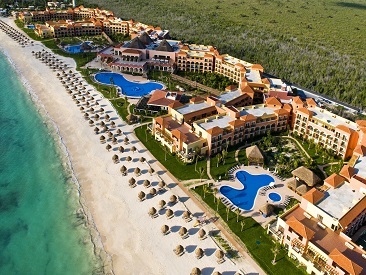 The Turquesa side is quieter, perfect for couples and adults seeking a relaxing vacation experience. There may be a few kids around, but most of them will be on the Coral side where guests will find plenty of music and activities around the Coral pools. 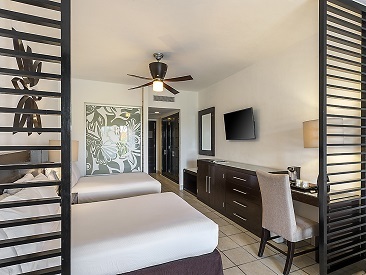 Ocean Coral and Turquesa is excellently located just 12 miles from Cancun International airport, 22 miles from Playa del Carmen and 20 miles from the center of Cancun. The Privilege Concierge Program features a host of exclusive services and amenities. This hotel does not accept spring breakers. For travel beginning on or after February 1, 2019 and through the night of April 30, 2019, no customers 23 years or younger are allowed unless there is at least one adult over 30 years old in the same room. Student or spring breaker groups with guests ages 16 to 23 years old are not allowed even when accompanied by adults over 30 years old. For travel beginning January 1, 2019, an environmental tax of $24.18 Mexican Pesos (approx $1.26 USD, subject to exchange rate variations) will be in effect. This tax will be collected from all guests staying in Puerto Morelos Municipality. The tax can be paid in US Dollars or Mexican Pesos, by cash or credit card, upon check-in. This tax is subject to yearly adjustments.